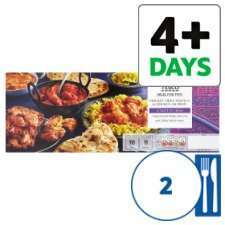 I find Tesco indian ready meals to be quite decent, this is a lot of food for a very little money. £4 to feed two people, or if you are a loner like me, 2 days worth for myself! I edited the post when Splashmo kindly provided that info! Weirdly the mobile app didn’t show it to me first time around. Ah well, can never have too much info. By the way, did you know this comes with 1 masala, 1 jalfrezi, 2 naans, a basmati rice and 4 onion bhajis? These are quite decent. Great value for £4. You get the jalfrezi, tikka, basmati rice, 2x naan and 4 onion bhajis. These are quite decent. Great value for £4. You get the jalfrezi, tikka, …These are quite decent. Great value for £4. You get the jalfrezi, tikka, basmati rice, 2x naan and 4 onion bhajis. Weirdly the mobile app didn’t show it to me first time around. Ah well, c …Weirdly the mobile app didn’t show it to me first time around. Ah well, can never have too much info. By the way, did you know this comes with 1 masala, 1 jalfrezi, 2 naans, a basmati rice and 4 onion bhajis? No Splashmo - thank you for providing the info! I edited the post AFTER you provided it!! Apart from the fact I meant pilau, not basmati. Wish they didnt put cashew nuts in the Tikka Masala! I know right, toasted almonds would be much better. If you fancy cooking your own authentic BIR curry. Great choice for non meat eaters as usual. It's a worry, how long use by date is on these curries! What do they add to it for chicken to last more than ten days?! And I agree that the recipe has changed a lot recently, and the values have gone from unhealthy to very unhealthy!! Had a look lately? Not sure how 5 teaspoons of sugar has managed to stay green?!! Not voted either way, although I know a curry should be hot! It's a worry, how long use by date is on these curries! What do they add …It's a worry, how long use by date is on these curries! What do they add to it for chicken to last more than ten days? !And I agree that the recipe has changed a lot recently, and the values have gone from unhealthy to very unhealthy! !Had a look lately? Not sure how 5 teaspoons of sugar has managed to stay green?!! [Image] Not voted either way, although I know a curry should be hot! They probably taste nicer as a result though. Masala is to Curry what Homer Simpson is to Genius IQ. Yes. I was considering buying today and then read the fat content. Not usually something I pay too much attention to but felt it was pretty shocking so put back. The other pack (think two meal versions in offer) had 89% daily fat content. Put some out at work earlier. 2 of them were dated for the 24th, one for the 25th. That's not more than 10 days. Regardless... I don't think they've been half price to £4 in a long time. Normally down to £5. Really great value there when compared to the meal for ones which often go down to £2. Put some out at work earlier. 2 of them were dated for the 24th, one for …Put some out at work earlier. 2 of them were dated for the 24th, one for the 25th. That's not more than 10 days.Regardless... I don't think they've been half price to £4 in a long time. Normally down to £5. Really great value there when compared to the meal for ones which often go down to £2. Yep - the lowest you usually get is £5. Just freeze them if there's an issue with the Use By Date. Yes. I was considering buying today and then read the fat content. Not …Yes. I was considering buying today and then read the fat content. Not usually something I pay too much attention to but felt it was pretty shocking so put back. 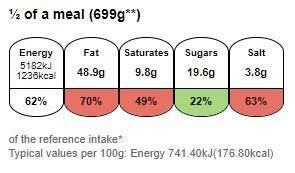 The other pack (think two meal versions in offer) had 89% daily fat content. If you were eating them on a VERY regular basis, then fair enough. But if you're having something like this on an occasional basis, and you enjoy them, then what's the problem? If you were eating them on a VERY regular basis, then fair enough. But if …If you were eating them on a VERY regular basis, then fair enough. But if you're having something like this on an occasional basis, and you enjoy them, then what's the problem? My thought was, if i was going to eat something bad for me id like to make it worthwhile. Last time I checked, there wasn't someone holding a gun to your head forcing you to buy/eat one! My thought was, if i was going to eat something bad for me id like to make …My thought was, if i was going to eat something bad for me id like to make it worthwhile. It's not "bad" for you though! Unless it's out of date and/or you were eating it daily!! It's not "bad" for you though! Unless it's out of date and/or you were …It's not "bad" for you though! Unless it's out of date and/or you were eating it daily!! Lol! We're a vegetarian family. No, no chicken koma. However, they do have chicken korma on offer. Think it actually comes with ONE portion and not 2 as stated in OP otherwise that would be for 4 people and not 2.